In Motive 1.10 and above, Cameras pane has been renamed to Devices pane, and previous Devices pane has been renamed to Device Connections pane. The Devices pane can be accessed under the View tab in Motive or by clicking icon on the main toolbar. The number of frames the camera or camera group will capture per second. The minimum and maximum values for frame rate depend on the model of camera that you are using. A higher frame rate will allow for more frames per second of data, and help prevent motion blur. A lower frame rate will allow for higher exposure values (and brighter images) and will also reduce the bandwidth required to transmit data, which can help in systems with high network or USB traffic. Note for Flex 3 Systems: There is a known issue where adjusting system frame rates under the Devices pane is not working properly. To adjust frame rates in Flex 3 camera systems, go to the Synchronization pane, switch to custom synchronization mode, make sure Sync Mode → OptiSync is set, input desired frame rate under the Internal Sync Freq (Hz) entry, and apply the customized sync configuration. Sets the amount of time that the camera exposes per frame. The minimum and maximum values will depend on both the type of camera and the frame rate. Higher exposure will allow more light in, creating a brighter image that can increase visibility for small and dim markers. However, setting exposure too high can introduce false markers, larger marker blooms, and marker blurring--all of which can negatively impact marker data quality. Exposure value is measured in scanlines for V100 and V120 series cameras, and in microseconds for Flex13, S250e and Prime Series cameras. Defines the minimum brightness for a pixel to be seen by a camera, with all pixels below the threshold being ignored. Increasing the threshold can help filter interference by non-markers (e.g. reflections and external light sources), while lowering the threshold can allow dimmer markers to be seen by the system (e.g. smaller markers at longer distances from the camera). Sets brightness level for the camera IR LED ring. Higher LED values allow the camera to emit more IR light, which can allow for better marker detection at longer ranges. However, a value that is too high may cause reflection off of non-marker objects, which can destabilize data. Generally, the value should be higher for larger volumes and lower for smaller volumes. Default is dependent on camera model. This icon indicates that the camera or camera group is in Tracking mode. Clicking on this will change the camera or camera group to Reference mode. This icon indicates that the camera or camera group is in Reference mode, while it is recording video, will not be tracking markers. Clicking on this will set the camera or camera group to Tracking mode. Increasing a camera’s gain will brighten the image, which can improve tracking range at very long distances. Higher gain levels can introduce noise into the 2D camera image, so gain should only be used to increase range in very large setup areas, when changing illumination, exposure, and threshold are not sufficient. The following properties can be configured when the Tracking group is selected from the Devices pane. This properties section configures properties for the whole camera system. Filter Switch: Sets the camera to view either visible or infrared light on cameras equipped with a Filter Switcher. Infrared Spectrum should be selected when the camera is being used for marker tracking applications. Visible Spectrum can optionally be selected for full frame video applications, where external, visible spectrum lighting will be used to illuminate the environment instead of the camera’s IR LEDs. Common applications include reference video and external calibration methods that use images projected in the visible spectrum. Automatic Gain Control: Default: False. Automatic Gain Control feature adjust the camera gain level automatically for best tracking. This feature is available only in Flex 3's and Duo/Trio tracking bars. Video Type: Configures video type for the selected camera. Several modes are available for efficient on-camera image processing. Available modes vary slightly, depending on camera model. Read more from Data Recording page. Illumination Type: Sets the illumination to either Strobed or Continuous. Strobed illumination will output more light with equivalent power when compared to Continuous and is the ideal choice for standard motion capture volumes. Continuous is ideal for volumes where external IR interference is potentially an issue (e.g. with IR actuated stereovision systems that cannot synchronize to the OptiTrack cameras, or when other volumes may be within line of sight). Name: Sets the name for the selected camera group. Camera Color: Sets the color for camera group members as they appear in the 3D viewport. Color values are input as standard RGB triplets. Visible Cameras: Selects whether cameras in the group are displayed in the viewport. Show Volume: Selects whether the capture volume (defined as capable of tracking a single marker) is displayed in the viewport. Enabling this will allow the volume to be displayed as a wire cage around the ground plane where multiple cameras fields of view intersect. Valid options are True, False (default). Camera FOV: Selects whether camera FOVs are displayed in the viewport. Camera FOV accurately depicts the frustum angles, while depth is artificially capped. Actual depth may vary depending on camera settings and marker size. Enabling this feature can be beneficial in volume visualization for creation and adjustment. Valid options are True (default), False. 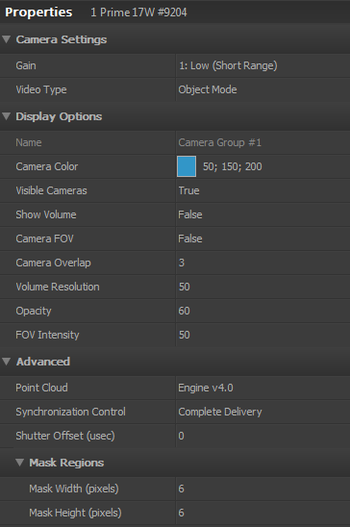 Camera Overlap: Sets the minimum camera overlap necessary for a region to be visualized as part of the capture volume. Higher numbers represent more camera coverage, but they will tend to reduce the size of the visualized capture volume. Valid range is 1 to 25 (default 3). Volume Resolution: Sets the resolution of the capture volume visualization. A higher number represents a more detailed visualization. Valid range is 1 to 120 (default 50). Opacity: Sets the opacity of the volume visualization. A value of 1 is transparent and 100 is opaque. Valid range is 1 to 100 (default 100). FOV Intensity: Sets the opacity of the FOV visualization. A higher value represents a more opaque volume visualization. Valid range is 1 to 100 (default 50). Selects which point cloud engine will be used to reconstruct 3D points. v1.0 Point cloud engine v1.0 is particularly well suited for high marker counts and fast movements. v2.0 Point cloud engine v2.0 is more CPU intensive, and is accordingly more susceptible to latency when tracking complex point clouds, but it can produce cleaner data than v1.0 in smaller scale applications. v4.0 Point cloud engine v4.0 is recommended for most applications. It combines the high quality reconstruction output of v2.0 with the speed of v1.0 to provide balanced reconstruction speed and performance. Synchronization Control: Determines how late camera frames are dealt with. Timely Delivery will drop late frames, which is ideal for real-time applications where data completeness is secondary to timeliness. Complete Delivery will hold up processing of frames when a frame is late. Automatic, which is the default and recommended setting, runs in Timely Delivery mode until it gets a non-trivial percentage of late frames, at which point it will automatically switch to Complete Delivery. Fan Mode: Provides an option to turn off the camera fan during recording, for S250e cameras only. Shutter Offset: Delays the shutter timing of selected tracking camera group for N microseconds. Mask Width (pixels): Sets the extra pixel coverage (width) for masking visible markers when the mask visible function is used. A larger number will block a wider grouping of pixels simultaneously. Valid range is determined by the resolution of the cameras. Mask Height (pixels): Sets the extra pixel coverage (height) for masking visible markers when the mask visible function is used. A larger number will block a wider grouping of pixels simultaneously. Valid range is determined by the resolution of the cameras. The following properties can be configured when a Camera is selected from the Devices pane. Gain Sets the gain setting for the selected camera. Video Type Sets the video type of the selected camera. Force plate group configurable properties. 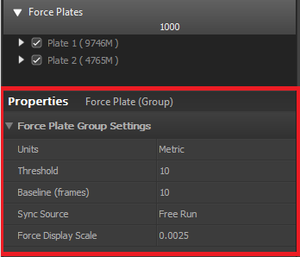 The following properties can be configured when Force Plates group is selected from the Devices pane. Units: Default: Metric. Sets the units for displaying force and moment data on the timeline graph. Threshold: Minimum threshold, in N, force required for the resultant force to be displayed in the view port. Baseline (frames): Sets the length of initial recording, baseline, frames to be used as the reference zero samples in C3D files. During the initial frames, no load should be applied to the plates. Sync Source: Sets the Sync source for the force plates. For now, the force plates (AMTI) only support Free Run mode with manufacture defined sampling rates, read more at Quick Start Guide: Force Plate Setup. The custom synchronization setting must be configured first before configuring this. Force Display Scale: Adjusts the size of the resultant force vector displayed in the 3D viewport. 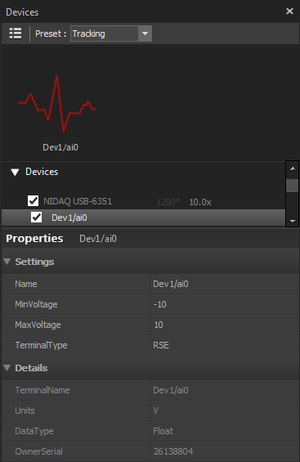 NI-DAQ device properties displayed in the Devices pane. 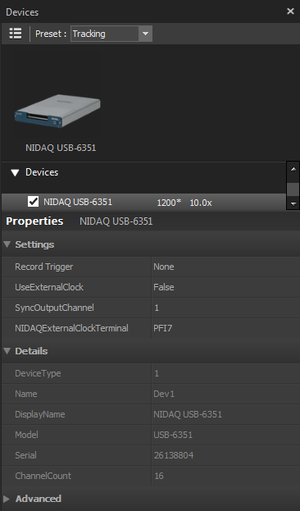 NI-DAQ device channel properties displayed in the Devices pane. The following properties can be configured when a NI-DAQ device is selected from the Devices pane. Record Trigger: This setting determines how the recording of the selected NI-DAQ device will be triggered. Setting it to True will use hardware data packets to trigger the record start frame. 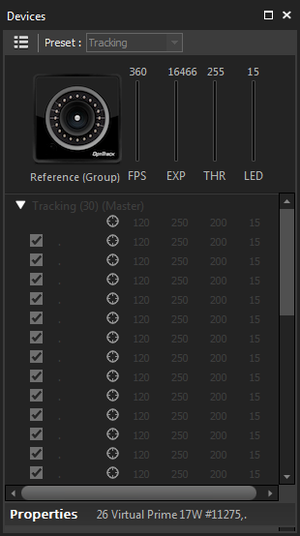 Setting it to False will trigger the recording when Motive starts capturing data. Use External Clock: Sets whether an external clock signal is used to sync the devices. The custom synchronization setting must be configured first before configuring this. True: Setting this to true will configure the selected NI-DAQ device use external sample clock to control its sampling. The NI-DAQ board must be connected to an external clock output of the eSync on one of its digital input terminals. The acquisition rate will be disabled since the rate is configured to be controlled by the external clock. False: NI-DAQ board will collect samples in 'Free Run' mode at the assigned Acquisition Rate. Acquisition Rate: When the Use External Clock setting is set to False, acquisition rate for NI-DAQ device(s) can be set individually in the Devices pane. You can modify the multiplier to change the acquisition rate to multiples (up to X16) of the camera frame rate. This sets the acquisition rate of the NI-DAQ devices when synchronizing without an external clock signal from the eSync. In this case, the devices will be running at the Free Run mode, and the NI-DAQ device(s) and the cameras will be triggered simultaneously but they will capture at their own sampling rate. Synchronization offsets will be introduced when using the free run mode. NIDAQ External Clock Terminal: Name of the NI-DAQ digital I/O terminal that is connected to the external clock (TTL) signal. The following properties can be configured a analog input channel under a NI-DAQ device is selected from the Devices pane. Depending on the model, NI-DAQ devices may have different sets of allowable input types and voltage ranges for their analog channels. Refer to your NI-DAQ device User's Guide for detailed information about supported signal types and voltage ranges. Terminal Type: Configures the measurement mode of the selected terminal. In general, analog input channels with screw terminals use the single-ended measurement system (RSE), and analog input channels with BNC terminals use the differential (Diff) measurement system. For more information on these terminal types, refer to NI documentation. Terminal: PseudoDiff Differential. Measurement between two inputs and impeded common ground. This page was last modified on 3 July 2017, at 14:39.